India’s Leading Business Conglomerates - .::CUMI::. 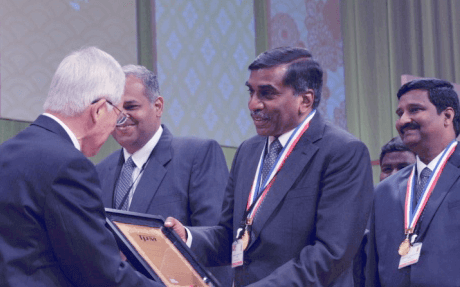 The SRIPERUMBUDUR (SPR) and MARAIMALAI NAGAR (MMN) plants of CUMI – Abrasives Division have been awarded the TPM Award for Excellence – Category “A” by Japan Institute of Plant Maintenance (JIPM), Japan. This is the Level 1 Award. 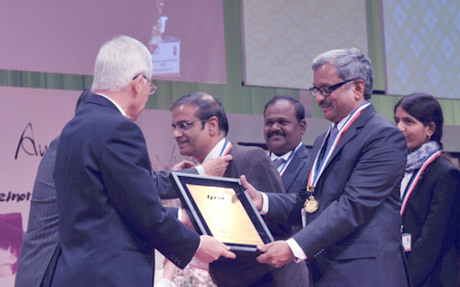 The Award ceremony took place on 18th. March 2015 at the International Conference Centre (ICC), Kyoto, Japan. The Award comprises of a Plaque and medals to the people present from the company / plant for the Award function. These Awards are given to Companies in Japan and companies outside Japan. The SPR and MMN plants participated in the Awards given to companies outside Japan. A Plant has to practice TPM for a minimum of 3 years to apply for this Award and should have achieved substantial improvements on Productivity, Quality, Cost, Delivery, Safety and Morale (P,Q, C, D, S, M ) indices. The Plant should use the 8 Pillar TPM Approach in the journey of Manufacturing Excellence. Safety, Health and Environment (SHE). Level 1: TPM Excellence Award, Category A and Category B. Level 2 : Excellence in Consistent TPM Commitment. Level 3 : Special Award for TPM Achievement. Level 4 : Advanced Special Award for TPM Achievement. Level 5: Award for World Class TPM Achievement. In the case of Category B, it is enough to practice 5 Pillars namely KK, JH, PM, E&T and SHE while in the case of Category A needs to cover all the 8 Pillars. The process for Award is that the Plant / Company has to make an application and then present a Activity report covering the work done in the Plant for 3 years and also provide information on the Business results and PQCDSM parameters. Then there is a two stage assessment done by the Japanese assessors from JIPM, Japan. The assessors from JIPM, Japan were Masayoshi Sugiura San and Shigenobu Nomura San. The first stage assessment was done in June 2014 where the assessors cleared the Plants for Second Stage assessment had indicated some of the areas where further improvements could be done as Homework points. The second stage assessment was done in November 2014. We were selected for the Award after this Two Stage assessment process. Totally 88 Plants from different companies across the globe (outside of Japan) were selected for awards under different categories. Q. Could you give a overview of the Murugappa Group? Founded in 1900, the Rs.24,000 crore Murugappa Group is one of India's leading business conglomerates. The Group has 29 businesses including eight listed companies actively traded in NSE & BSE. Heaquartered in Chennai, the major companies of the Group include Carborundum Universal Ltd, Coromandel International Ltd., EID Parry (India) Ltd., Parry Agro Industries Ltd., TI India Ltd., and Wendt (India) Ltd. Market leaders in served segments, the Group has wide geographical presence in India and 5 continents. Q. What is the standing of Carborundum Universal? Carborundum Universal Ltd or CUMI is the flagship company of the Murugappa Group. CUMI's own business includes Abrasives, Refractories, Electrominerals, Industrial Ceramics and Bio -Ceramics. 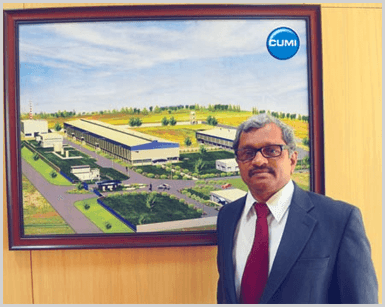 CUMI was formed in April 1954 as a tripartite venture with three well-known companies coming together: Carborundum of the USA, Universal Grinding Wheel Co. of UK and the Murugappa Group. In mid-80's it became Murugappa's wholly owned company. Q. You are a well-known name in Abrasives. What precisely is your niche? Well, we make the widest range of Abrasives for industries for multifarious applications. We have bonded and coated abrasives. Bonded abrasives are bonded to glass, rubber or metal or vitrified. Non-woven abrasives and super abrasives are also available. We make abrasives in 10 mm diameter in the smallest rage to 1200 mm dia. The thickness also varies from 1 mm to 350 mm. Among the 20,999 types of abrasives we make, about 8,000 are regular ones. Grinding wheels re used for heavy material removal, coated abrasives are used for less material removal, non-woven types are used for no removal but better finish, and super finish products re used for mirror finish. Besides abrasives for grinding and cutting, we also make coolants, power tools and super abrasives. The uniqueness of the product design allows for the most optimum grinding performance i.e. good cutting action coupled with excellent tool life. The core strength of CUMI has been the ability to customize products for specific applications. Q. How do you infuse quality in your products? Everything starts with raw materials. By virtue of our backward integration, we use the best of raw materials manufactured by us. When we have to source from outside, we order them from our approved vendors who are ISO certified and who have a rigid quality control regimen. All our grinding and cutting discs are manufactured in our state-of-the art manufacturing facilities which re IO-9001, ISO-14000 and ISO 18000 certified. We have stringent process control and final product quality checks. By this not only the best grinding performances are achieved, but also the highest levels of product safety is maintained in accordance with EN-12413 standards. In our plants we have been practicing TQM since 1994 and TPM since last 2 ½ years. Our plants have also won the GIPM Excellence Awards. Q. Where are your manufacturing facilities located and what' your staff strength? We have eight manufacturing plants three in Chennai (Thiruvottiyur, Maramalai Nagar and Sriperumpudur), one in Hosur, one in Bangalore, one in Uttaranchal, one in Kolkata and one in China. We also have a joint venture company in Ahmedabad known as Sterling Abrasives. We have 700 employees on our pay roll and equal number on contract. Q. How well equipped are your production facilities? Our production process involves mixing of different raw materials, compressing, drying, firing, finishing and so on. We have sophisticated production equipment to take care of all these processes, including mixers, hydraulic presses, drying houses, furnaces and finishing/shaping equipment. Q. You also offer materials handling equipment? As a precursor to e-commerce, we are also into trading of engineering product. These include materials handling equipment like pallet trucks and stackers. The idea is to provide the customer with a full basket of products which are cost-effective and at the same time of proven quality. Q. Would you say you are a diversified company? We are diversified in the sense we make our own raw materials required for manufacturing our end products. We make Minerals, Abrasives, Ceramics & Refractories. Q. Which are your market segments? We cater to industries as diverse as automotive, automobile ancillaries, fabrication, steel , cement, petrochemicals, general engineering, metalworking, interior, furniture, wood, painting and even retail. We have customer in auto component manufacturers, bearing companies, carpenters and even welders – a wide spectrum. We have a nationwide distribution network and have 550 plus dealers across the country. Ten percent of our sales goes to exports. Our export markets include USA, Europe and Far East. Q. What are the pioneering efforts you had to make to perfect your manufacturing process? There has not been any significant change in the manufacturing process. The changes are in the deign of wheels for specific applications. The technological breakthroughs are in the design and the way wheels are formed. For instance ball grinding wheels. The formulations plus the manufacturing process make them unique. We are the only company making ball grinding wheels in the country. Q. What are the new developments in the abrasive technology and how do you keep yourselves in step with them? In abrasives, the trend today is to focus on forming and final finishing. This is to be achieved with less material removal and adding value. We are in step with this trend. Q. What is your role in customer education? We have regular training programs on 'Right selection and safe operation of grinding wheels. We often do these programs at customer ends. Our program on 'Smart Grinding Technology' helps the end users to improve their knowledge of latest technology, products and applications. We also have a training program named 'Cumi Ustad Program' specially designed for our dealers who in turn can guide our customers in the right selection and use of abrasives. Q. What are your growth plans? Last year we achieved a turnover of Rs.2,200 crores. In 2014-15, we are targeting an increase of 15% in the turnover. We are yearning to be a part of the 'Making India' Campaign. Our focus will now be more on the 'finish' side of the business. Q. Finally, what is your most significant contribution to the industry? We believe and work towards sustainable development. CUMI tagline now is 'Making Materials Matter'. In line with this we make and offer our products to help improve productivity, quality ad sustainability in the industry. As a matter of fact, our contribution, performance, beliefs & values and pursuit of excellence have been recognized at different levels by different institutions. Just to give some recent examples, our Managing Director, Mr. K. Srinivasan has been adjudged as the 'Best MD' from among mid-size companies. The same way, our Chief Finance Officer has been chosen as the 'Best CFO' by Business Standard. Recently, we have also received an Award from CII for 'HR Excellence'. Carborundum Universal (CUMI), part of the Chennai-based Murugappa Group, may well be described as a mini General Electric as it produces a gamut of products used as raw materials for different applications. The firm produces raw materials used in simple products like a face scrub or kitchen scrubber to paints, clothes, coal washeries and rice polishing. Besides, it makes raw materials for the catalytic converter for automakers and also supplies silica carbide to nuclear power plants. While catering to such a diverse customer base, the company has also maintained a balance in organic and inorganic growth over the past five decades. "We have planned our long-term growth in such a way that twothirds of our growth will be led by the inorganic route and the rest will be driven by the organic route," said K Srinivasan, managing director of CUMI. "All our acquisitions are pursued according to a set policy followed by the company's management. If the prospective company fulfils our criterion, we plan our acquisition strategy," he added. The company has clocked an annualised growth of 22% over the past eight years, reporting a revenue of Rs 2,039 crore in 2013-14 compared to Rs 539 crore in 2005-06. This happened largely due to the acquisitions made by the company over the past 15 years. During this period, the company bought about 40% stake in Wendt India, 51% in CUMI Australia, 51% in Forkor Zirconia (FZ) of South Africa and 86% in Volzhsky Abrasive Work (VAW) of Russia. In the past two years, however, some of its acquisition bets have gone awry and the company has, therefore, been taking several difficult and tough measures to get back in shape. "In the current financial year, all our overseas acquisitions will start to grow considerably healthy from the third and fourth quarter onwards, except for RHI and Thukela. We are considering restructuring some of these loss-making entities based overseas," said Srinivasan. "Post the restructuring of these overseas entities we would be comfortable to grow at a long-term CAGR of more than 20%. We are quite positive on the significantly ramped-up volumes of VAW and FZ. It is just a matter of time as to when they start adding to our top line. Once the volume picks up, it would certainly start helping improve our margins," he added. In the past two fiscals, the company's operating profit margin dropped to 13% of net sales, compared with 19-20% between 2009-10 and 2011-12. The slackness in the domestic economy took a toll on the company's capacity utilisation and led to losses at its overseas units. The company now sees green shoots, both in the domestic and overseas markets, as its overseas units such as FZ are turning profitable again and the order inflow is picking up in India as well. Its Russian subsidiary VAW is annually producing 80,000 tonnes of silica carbide (SIC), which is used as an abrasive. It can produce an additional 100,000 tonnes. A technical hitch that it had faced while ramping up production at one of its bubble plants at FZ is also expected to be resolved soon. In the near term, the company is confident about revival in its domestic business on expected recovery in demand from the ongoing quarter. "We have now started seeing an order inflow. Though the orders have not become sales in the first quarter as much, there is a clear order inflow from the automotive and auto-component sectors. This will result in an improvement of our margins from the second quarter of 2014-15," said Srinivasan. The company's margins have already turned for the better, but a further improvement is expected from the next quarter, he said, adding that the order inflow was very good in June and July amid growing auto sales. Domestic sales account for as much as 75% of the consolidated revenues for the company. CUMI plans to drive its domestic sales by a combination of new and innovative products. It is striving for 15-18% of its sales from new products, benchmarking itself against global rivals such as 3M that derives nearly 25% of their sales from new products every year. In the domestic market, the company is clocking Rs 150 crore in sales of new products every year, primarily due to the verticals such as power tools, consumer business, thin wheel and super abrasive segment. It commands a share of about 25% in the domestic abrasive market, where it is ranked second after the multinational company Grindwell Norton. "Our products were able to successfully make inroads in the domestic market because we have made our products keeping in mind that they are needed for 'rough usage'. We build our products for 'misuse' rather than for 'use'. This helped us in building our business, compelling most of our customers to come back to us as our products have tremendous longevity even after being mishandled," said Srinivasan. Despite being a minnow in comparison with global firms such as 3M and Saint Gobain in terms of research and development, the company is continuously increasing spending on innovation. So far, it has produced two products that have the potential for commercial success. One is hydrogel, produced at the Pusa Institute, which absorbs water nearly 500 times than the normal soil and increases the yield by as much as 30%. The hydrogel technique has been introduced by the company in five states. The second product the company is working on is the bioceramic strip that will help heal wounds.